In 2008, Nova Bus, a bus manufacturer founded in Canada and owned since 1998 by the Volvo Group, wanted to expand its presence in the United States with a new facility. The company decided to do so in Plattsburgh, in New York State’s North Country region, near the Canadian border. New York City has the largest transit network in the United States, which is “one of the main reasons why [we picked] New York,” says Plattsburgh production manager Peter Allen, who has been with the company since 2009. Located about 90 miles from the company’s headquarters in Saint-Eustache, Quebec, the 140,000-square-foot Plattsburgh location is a full assembly plant that works in conjunction with the team in Saint-Eustache, and the company’s other site in Saint-Francois-du-Lac, to transform stainless steel structures into buses ready for use across transit systems worldwide. Over the past several years, there has been historic investment in infrastructure projects in New York State, like the 2016 plans to reimagine Pennsylvania Station, and to streamline bridge and tunnel traffic with “Open Road” automatic tolling. Nova Bus is at the forefront of innovations with contracts for transportation networks including New York City Transit, part of the Metropolitan Transit Authority (MTA), and recent orders for transit systems in San Antonio and Dallas, Texas, and Montreal, Quebec. Nova Bus got its start in Canada in 1993. The Plattsburgh plant is home to the Nova Bus LFS® line, designed for high-capacity and with accommodations for passengers. Each bus features s kneeling system that allows curbside boarding, an ADA-compliant ramp, and two wheelchair securement systems. The buses are built with an eye toward energy-efficiency and the company’s goal of “sustainable mobility,” shifting gasoline-powered fleets to compressed natural gas (CNG) vehicles, hybrids and electric buses. “Alternative fuels, other than diesel, are something our customers are looking for,” plant manager Jason Martin says. “Natural gas is a really popular fuel.” Nova Bus was joined in Plattsburgh by its sister company, Prevost, in 2014. 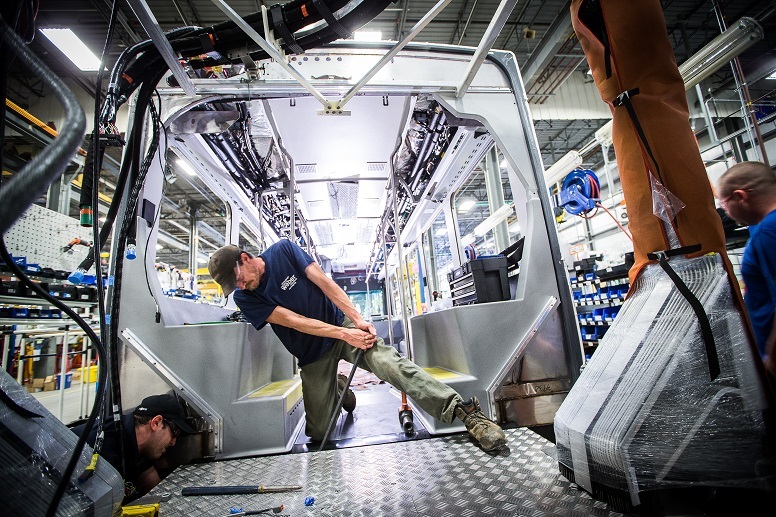 Prevost opened up a new production line at that facility with an initial order for 300 commuter coaches for New York City Transit. Both Martin and Allen were drawn to the company’s values and their chance to lead in Plattsburgh. “I fortunately had the opportunity to see the plant grow up,” Allen explains of his early work in Plattsburgh. There was “the opportunity to lead a plant and shape how the culture evolves,” adds Martin, who came on in 2014. Both men were also drawn to the company’s support for its employees. “The emphasis they put on people was attractive to me,” Martin says, describing the factors in his decision to join Nova Bus. “New York City was the first contract we did,” Allen says, explaining that the plant’s work for MTA has been integral to their growth and success. “It’s also who we cut our teeth with,” Martin echoes, saying that the company will work anywhere from nine to 18 months on a particular vehicle, and often builds prototypes that go on test runs, especially when fulfilling contracts in places like New York City. New York City Transit, Martin says, has “immense experience with building buses,” and that experience provides growth opportunities for Nova Bus. “Every time we learn; they are genuinely concerned about helping us become the best bus builder we can be.” That high bar has helped Nova Bus grow. In 2015, the company broke ground on a Plattsburgh expansion for a customer delivery center for both Nova Bus and Prevost, designed to cater to customers and house 10 spaces for bus delivery. It’s also a period of growth in the North Country, a hub for the transportation industry. The Plattsburgh area is home to more than 30 aerospace and transportation-related businesses, including Norsk Titanium, a Norwegian aerospace company, and Demers Ambulances, a leader in ambulance manufacturing and design in North America and Canada. To source the engineers, builders, and other employees Nova Bus seeks, the company partners with local agencies, as well a few specific programs at area schools, including Clinton Community College — a part of the State University of New York system. That school is spearheading a new Institute for Advanced Manufacturing, and Nova Bus is working alongside other area companies to help Clinton produce the best program possible for its students. In addition, Clarkson University provides a number of “high quality technical people,” Martin says, that helps the company maintain its strong workforce. Additionally, both Allen and Martin say the area’s culture and natural beauty offer major quality of life bonuses to working in Plattsburgh, pointing to the plant’s proximity to the Adirondacks and to Lake Champlain. “We live in an area where people come to vacation all the time,” Allen says. Allen, who also was born and raised in Plattsburgh, explains that the location benefits from a steady stream of Canadian traffic: “I’ve seen over the past couple years the Plattsburgh economy is getting bigger and bigger,” he says. In 2016, downtown Plattsburgh also won a $10 million award from the state as part of a Downtown Revitalization Initiative geared toward helping the area expand and grow. “I think public transportation is a really great industry to be a part of,” Martin says. “You already see the huge transformation taking place,” in the way people get around. Martin and Allen think that there’s a lot of potential for further growth in public transportation, remarking that when they were teenagers, getting the use of an individual car or license was a rite of passage. Today, many people are shifting toward a public transit lifestyle to free up their commute time and be a part of a safe, cost-efficient, communal way of getting around town. People “still obviously want to move around,” Martin says. “We’re in the industry that can help them move, and still be able to move around, get to their jobs, their schools,” he says, musing on the impact of the buses he and Allen work on every day. In the United States right now, “there are a lot of opportunities for expansion of public transportation to really make it world-class within a lot of our urban areas,” Martin concludes. With its work on buses and transit systems, Nova Bus is helping to define and champion the next era of public transit solutions, one ride at a time. For more information on the transportation equipment industry in New York State, contact Gio Holmquist at Transportation.Equipment@esd.ny.gov or (518) 292-5200.